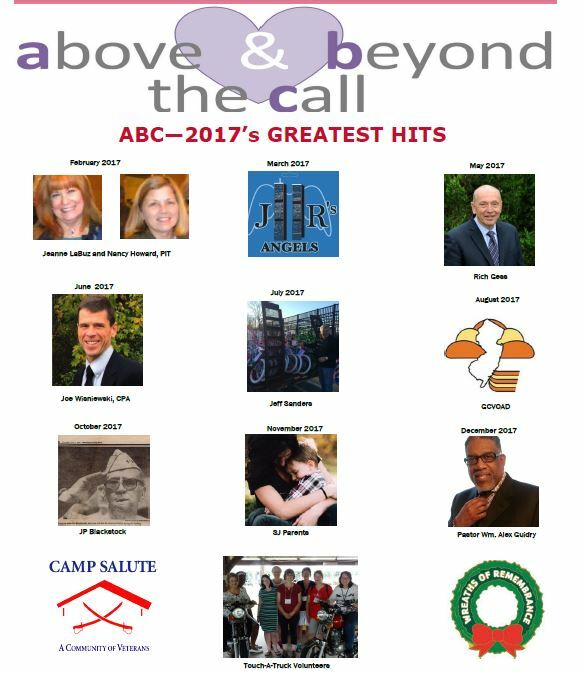 The Above and Beyond the Call (ABC) for October, Gloucester County Community Organizations Active in Disasters (COAD), includes members of the Heart of South Jersey, The People for People Foundation, and Senior Corp. These organizations are taking a lead position in the development of the COAD. The mission of COADs throughout the state is to bring together volunteers and service and business organizations that are willing to volunteer their time and talents to become active in disaster assistance and to foster cooperation and coordination in preparedness, response and recovery. Organizations such as these are sometimes called Voluntary Organizations Active in Disasters (VOAD) that are primarily made up of charities and non-profits. COADS bring together the entire community. 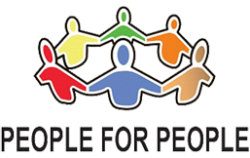 People for People and Senior Corp are currently setting up an Executive Board that will be manned by representatives from area organizations and businesses that will help recruit volunteers, be involved in basic training, provide information to be captured in a central data base listing volunteers talents and services that would be willing to be called upon if needed before, during, or after a wide spread disaster. It will also be able to reach out to businesses and providers of goods and equipment willing to provide assistance during emergencies. There has not been a time over the past several years that Gloucester County has experienced an emergency that required a county wide response. Past events that did require multiple volunteers were the the train derailment in Paulsboro a few years ago and Hurricane Irene when 1100 people from Atlantic City were sent to Rowan University. People for People was called upon at Rowan during Irene and brought together teams of volunteers to assist the Red Cross and others. Thus the decision was made to make the effort to put together a COAD here in Gloucester County to be ready for any future emergencies. The Heart and PFP will provide ongoing information about the COAD development here in Gloucester County in future newsletters as well as announcements through other outlets. If you are interested in learning more about how you can help, contact Paul Blackstock at 856-579-7561 or at paul@pfpfoundation.org. 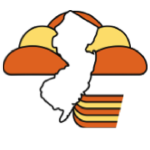 Gloucester County has been the home of a unique and much needed resource for 35 years. Our featured ABC for September 2018 is The Center for People in Transition, a Heart of South Jersey partner and a New Jersey Displaced Homemaker Center, conveniently located on the campus of Rowan College at Gloucester County in Sewell. A displaced homemaker is a woman who has been dependent upon the income of another while providing unpaid caregiving services in the home, but is no longer supported by that income as a result of divorce, separation, death, disability or deployment of the provider. They must now transition to the work world and do so in a time of extreme crises. These women are often emotionally and/or vocationally unprepared to enter the workforce​. The Center for People in Transition offers support in five ways: career and education, psychological, legal resources, social service referrals and financial information. The Center has staff that can prepare resumes, explain the job search process in today’s job market, practice interviewing, and give up-to-date information on what employers are looking for from their new hires during the interview and in the workplace upon hiring. Being ideally located on a college campus, the staff is aware of training and education opportunities that may be of additional interest to clients. Given the change in circumstance of the displaced homemaker, they may also be dealing with emotional issues that need to be addressed to overcome certain barriers to successfully navigate the path to self-sufficiency. The Center offers numerous workshops on self-esteem, letting go of past hurts, and bereavement to help through these emotions. Additionally, resources for social services and legal information are available to clients by appointment. Finally, workshops on budgeting for the new household are scheduled on a regular basis and conveniently held on campus. With the exception of their 40 hour computer workshops, all workshops are free and open to the public. The Center for People in Transition has proven to be a valuable resource for so many. They have been an intricate part of the Heart of South Jersey and will serve as a major partner in working with our veteran families at Camp Salute and through the South Jersey Veteran Resource Center. Please see their website at www.rcgc.edu/pit for a current list of workshops and visit us their Facebook page at www.facebook.com/centerforpeopleintransition. 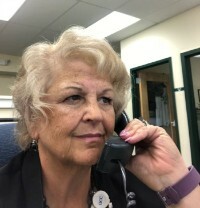 This month we are highlighting another member of the Heart of South Jersey team, The Gloucester County Senior Corps, headed up by Helen Antonucci. Serving Gloucester County since 1972, Senior Corps has become a much-appreciated resource and asset to Gloucester County. 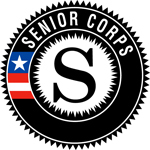 Senior Corps is a network of national service programs for Americans 55 years and older that takes a different approach to improving lives and fostering civic engagement. Gloucester County Senior Corps volunteers commit their time to address critical community needs including academic tutoring and mentoring, elderly care, disaster relief support, and more. 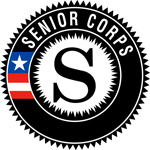 Senior Corps volunteers use their acquired skills, knowledge, and experience they have gained over their lifetimes to make a difference to individuals, non-profits, and faith-based and other community organizations throughout the United States. Gloucester County Senior Corps provides 320 volunteers to needy agencies to assist in serving the public in “priority needs” throughout Gloucester County. Those needs provide basic life supporting services that make a positive impact in the community and in the volunteers. We are lucky to have such a valuable resource available to Gloucester County residents providing an outlet for seniors in our community willing to share their time and talents with others. Thank you Helen for the outstanding job you have performed over the years heading up the Gloucester County Senior Corps. You are an inspiration to the Heart team as well as thousands of seniors whose lives were, and continue to be, positively impacted by your dedication and caring. Over the past several years Heart SJ has highlighted people or organizations in the community that have gone Above and Beyond the Call (ABC) in our monthly newsletter. This month we are going to begin highlighting the organizations that make up The Heart of South Jersey. For July, 2018 we will introduce you to the lead agency, The People for People Foundation. 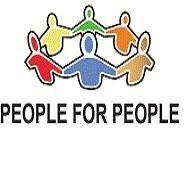 People for People started out in 2003 as a simple one year Mullica Hill Rotary Club project. The goal was to assist 12 normally self-sufficient families in different ways that were experiencing a difficult time in their lives. To be able to do so the Rotary Club held fundraisers and sought small donations from the business community. However, when word of the project went public, the club was overwhelmed with calls for help. In the first year the club provided funds to over 200 individuals and families for items such as food, clothing, medications, rent, utilities and other life essential items. The project received so many calls for help that it was decided to set up a 501 c 3 foundation to allow us to seek funds and assistance to help many others. The name People for People was chosen and the rest is history. For the first six years it was run by Bernadette and Paul Blackstock out of their home. In 2009 the work involved became so intense that the Blackstocks decided to make it their mission and left their insurance agency to work full time with People for People. Bernadette became the paid President and CEO and Paul became the unpaid volunteer Chairman. Since 2003 People for People has assisted and had a positive impact on the lives of over 17,000 individuals and families. They also developed a strong collaboration with hundreds of other help providers and agencies in the area and have become the resource center for many others. In addition to being the lead agency for The Heart of South Jersey through the Pascale Sykes Foundation, they have developed their own “Resource Directory” with over 2500 resources that has been described as one of the best directories in the region. People for People has also developed a relationship with a low to moderate income housing developer and to date has offered social services, life skills training and case management to over 500 individuals and families. People for People is also a “Veteran Preference” organization that holds an annual Vets Picnic that draws over 1000 people every year. They also founded the “Wreaths of Remembrance” program which has laid over 15,000 wreaths at the gravesites at the Gloucester County Veteran Memorial Cemetery. This month, People for People opened Camp Salute, an affordable housing development for low to moderate income people with a veteran preference. It will also house the South Jersey Veteran Resource Center run by highly trained staff. Camp Salute will be the first of its kind in the country combining permanent housing with full supportive veteran services and life skill training. President, Samaritan Center of Glassboro, Inc.
Our Above and Beyond the Call (ABC) for June, 2018 is Ingres Simpson and the Samaritan Center of Glassboro, Inc. Ingres serves as the organization’s president and is passionate about continuing its mission. Born in a small town in North Carolina, Ingres moved to Glassboro in 1975. She worked in the Clayton Public Schools for 26 years as a music teacher and supervisor of instruction prior to retiring in 2011. She is currently an adjunct professor at Rowan University. But what makes Ingres so impressive is her desire and efforts to give back to the community. You can also call her a pioneer in the field of local government. Ingres was the first women to be elected to the Borough Council in Glassboro where she served 15 very distinguished years in the ranks. She gained the respect and admiration of not only the people in her town, but also the people she served with. In 2014 Ingres joined the board of the Samaritan Center in Glassboro and has never looked back. Taking over the responsibility of president, the Samaritan Center could not be in better hands. What started as the Mayor’s Committee on Human Services back in 1981 by then Mayor William Dalton, the goal was to provide Glassboro residents with emergency services. Food and clothing were collected through the churches, Boys Scouts, the college and others. After setting up a food pantry at the First United Methodist Fellowship House in Glassboro and a clothing bin built along side of the American Legion, the organization moved forward in helping Glassboro residents in need. This arrangement worked for a while, but a larger home was needed. Through the efforts of one its founders, Bettye Bell, clergy, other community leaders, meetings with the mayor and council and a generous donation of $25,000 from Henry and Lee Rowan, a permanent home was built at 123A East High Street. The Samaritan Center is run by a deeply committed Board of Trustees, a part-time manager and dedicated volunteers. It serves Glassboro residents ONLY, who deal with economic difficulties, by providing free food once per month. Individuals and families must be able to prove they are Glassboro residents and provide proof of any government assistance they receive. The center is a 501c3 that qualifies for surplus state and federal food provided by the Southern Region Food Distribution Center. Non-perishable food and monetary support are also donated by local churches, other service organizations and individuals. Financial support is used to purchase additional food and pay for services that directly support its mission. Donations are tax deductible. 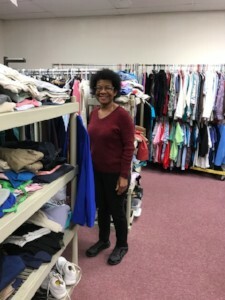 The Samaritan Center also operates a “Clothing Closet” at the same location where residents can purchase gently used clothing for the entire family at a very low cost. Prices range from 25 cents to $2.00. Ingres and The Samaritan Center of Glassboro, Inc., we salute you and are proud to call you friends. In August, 2013, magic was created, but no one involved knew the magnitude of what was to come. What the members of Generation didn’t know was how their performances would change and enrich so many lives. While understanding they would raise a few dollars for charities, they didn’t know they would change the spirits and hearts of so many. Generation gave its first mini-concert for Alzheimer’s patients five years ago. The original plan was to sing on a few occasions, raising money and awareness. Since then, Generation has collectively dedicated over 1,000 volunteer hours through various endeavors, performed at over 100 events and raised over $25,000. Members have never profited for their time dedicated during a charity performance, but rather donated the offerings to their choice charity. Christopher says, “Generation is more than volunteering. We started this hoping to make the world a better place one step, one song at a time, hoping to inspire others to do the same without expecting financial rewards. The rewards are far beyond money. What we receive supersedes anything material.” Jack adds, “Generation has become my family. We’ve grown together through our love of music and volunteer work. It makes me happy giving the gift of music to others.” Victoria comments, "When I started singing with Generation, the impact we made was seemingly limited. As we continued to perform, I realized just how meaningful our work was. I’m humbled by the community that supports us as musicians, and their willingness to aid those in need. The power music has to bring people together is one of the greatest things. I never thought it would lead to such incredible opportunities.” Amanda adds, “Being a member of Generation means more to me than just performing. For years we’ve raised money for various organizations. Through these experiences, I’ve had the opportunity to meet so many talented friends who I see grow every time they perform. Our teacher works so hard to train us professionally. We’re thankful for all his time, effort, humor and love. You won’t find Generation performing pop pieces, however, you may hear Bach or Handel. They’ve performed in numerous languages throughout South Jersey and their events offer classic pieces and familiar Broadway tunes. This is atypical for young performers, but so is their determination for making a difference in this life. APRIL 2018 - TOM VEEVERS, SR.
Our “Above and Beyond the Call” (ABC) for April, Tom Veevers, Sr. is a man who truly lives by the Rotary motto, “Service Above Self.” Starting his relationship with Rotary in 1980, he is more active today than ever before. His worldwide reputation within Rotary International is stellar. Tom recently retired as a Senior Regional Vice President for Ohio National Financial Services for the tri-state area. During his career he earned the designations of Charted Life Underwriter (CLU) and Chartered Financial Consultant (ChFC) and held six securities licenses with FINRA. He is Past President of the South Jersey Chapter of the Society of Financial Services Professionals. Tom is a graduate of Rutgers University and a Navy Veteran. He held multiple positions within Rotary from Club President to District Governor and currently serves as District 7640 Ambassador for the ShelterBox program. Where Tom’s heart really beats the loudest is for Rotary’s goal of ridding the world of Polio. Tom has traveled the world to immunize children against Polio, often paying his own way to help eradicate this terrible disease. He has formed and led National Immunization Days (NID) teams, bringing Rotary Volunteers together to travel with him to help with the mission. In January 2006 Tom led 25 Rotary volunteers to travel to Agra, India to immunize children against Polio, as part of one of three international teams that assisted in immunizing 75 million children on that date. In November, 2007 Tom led 15 Rotarians from South Jersey to Abuja, Nigeria as well as leading another 11 Rotarians to Mathura, India in 2009. In 2011 Tom led another immunization team of 23 individuals to Moradabad, India. But he was not done. He also led a team of 16 individuals to Ghaziabad, India in 2014 to immunize more children. He also visited Porto Alegre, Brazil to celebrate the successful conclusion of their mobile mammography bus. Tom just returned in March 2018 from his latest trip where he and his team of 18 immunized hundreds of children from Amritsar, India. 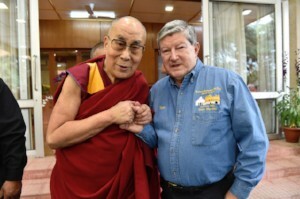 On this last trip Tom was introduced to the Dalila Lama in recognition of all his work with children and fighting Polio. (See Photo) This photo is so forceful because it shows admiration and respect between two great men. Tom has received numerous awards both locally and internationally. In 2008 Tom was awarded Rotary International’s “Service Above Self” Award, Rotary’s highest honor. In 2014 Tom also received Rotary’s Citation for Meritorious Service and will be receiving the “Regional Service Award for a Polio-Free World” in 2018. Married for 45 years to wife Barbara, also a Rotarian, you can say that Tom puts his energy where his heart is. We at People for People and the Heart are honored to be able to call this truly wonderful and caring man our friend. Thank you Tom. If you live in Gloucester County, there is a good chance that you have met or seen our March Above and Beyond the Call (ABC) recipient Daniele Spence. She is a resident of Glassboro and a boundless bundle of energy. She has so many talents in multiple areas that you never know where she will show up, or what she will be doing next. Daniele works at the position of Freeholder Aide at Gloucester County. She wears many different hats through her current position...from helping people in need to heading up a multitude of events around the county. Daniele also volunteers as part of the Glassboro Board of Health and the Glassboro Memorial Day Parade, and chairs the Glassboro Historic Preservation Commission. Daniele’s husband Fran is an Iraq and Afghanistan Veteran and a member of the Glassboro VFW Post 679 where she serves on the Auxiliary Board. But there is also another side of Daniele that may surprise many. 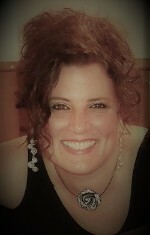 She has an incredible singing voice and musical talent that she enjoys sharing with others. She plays with the band, TK and the Howlers, a five piece band that plays classic and contemporary blues and rock music at many different venues in the region. Their music is rocking, and enjoyed by a large following. As lead vocalist playing acoustic and electric guitar, Daniele and the boys put on one heck of a show and play many charity events. But what makes Daniele so very special to us is her big heart and her willingness to share her talent with charitable causes, especially our military forces and veterans. When it comes to “Her Vets,” Daniele donates time and talent that far exceed anyone’s expectations. She must have sung the Star Spangle Banner at hundreds of veteran events over the years, to the enjoyment of all in attendance. She is also a member of a dedicated group of singers and entertainers that donate their time to perform at local VFWs, the Annual Vets Picnic, veteran luncheons and dinners, and other veteran events. As a solo act, her voice overwhelms all in attendance when she sings the old classics from rock to country. Those of us at The Heart especially like her Patsy Cline songs. With no disrespect to Patsy, Daniele’s singing is beyond description. You close your eyes and can imagine being at a Patsy Cline concert. We at the Heart and People for People thank you Daniele for not only all of your assistance with helping others, but also for allowing us and others to share in your wonderful talent. Simply put, Daniele, YOU ROCK! Bob Dalessando is our Above and Beyond the Call (ABC) for February, 2018. He is a lifelong Gloucester County resident that believes in giving back. You could say that Bob’s desire to give back came from his father. The senior Dalessando volunteered during WW II and became an Army Air Force pilot for the 80th troop carrier squadron, 436th troop carrier group. He flew the C-47 plane during some of WW II’s biggest battles risking his life flying into danger on a regular basis. His job was to fly into enemy territory with a plane full of paratroopers from the 101st and 82nd Airborne that would jump into battle behind enemy lines. Some of his missions were during Operation Market Garden, (airborne invasion of Holland,) Bastogne (Battle of the Bulge) and Operation Varsity, the invasion of Germany. Bob also served his country by joining the Army in 1972 and served in the states and Germany. He served for eight years and left the service with the rank of Captain. After leaving the service he worked for a number of Fortune 100 companies in operations management, sales and marketing. He left the Corporate world to start his own operation called Preferred Funding Solutions Group. Preferred Funding is a fundraising and marketing consultancy for 501-C organizations. It assists non-profits with fund raising via online consumer shopping. Bob also donates his time and support lending a hand with many of the non-profits he works with. He can be seen at many of the People for People , Heart of South Jersey and other local non-profit events. Bob also volunteers a great deal of time as the past president and current Board Member of the Rowan Toastmasters, a public speaking and leadership empowerment club open to both students and the local community. Bob works with members using his years of experience in the Corporate World as an inspiration and guide. Bob also volunteers time as the Membership Director for Gloucester County Network Connections, a networking organization for professionals in the Senior Care industry. In just the past few years his organization has donated over $10,000 to a variety of non-profits to help with their missions. Bob is also a Board Member of the Gloucester County Community Organizations Active in Disaster (GCCOAD) lending his organizational skills and contacts in the Health Care industry to help mobilize the community during and after a disaster..
Bob is an inspiration to many and a caring person willing to do what he can to help others. We here at the Heart of South Jersey and People for People are enriched by knowing Bob.